Grief is the normal and natural reaction when a pet has died. Everyone, including children perceives loss differently. Grief is a very personal and unique experience. One of the most difficult tasks for grieving children is to learn how to incorporate the death of a pet into their life and to figure out how to go on living without them. Regardless of their age, children can experience shock, denial, confusion, sadness, anger, blame, withdrawal, wishing, acceptance and healing after a pet dies. Keep in mind that children grieve differently at different ages. Younger children do not understand that death is final, sometimes not until the ages of nine or ten years. It is important that adults support children based on their individual needs as well as each child's unique ability to comprehend the finality of death. The younger the child, the more confusing the finality of death can be. It is important to be honest with children, but remember, that sometimes less information is better. Do not tell you child that you sent their pet away, when it has actually died. You could gently let children know that his pet's body was badly hurt in an accident and that its body cold not be fixed or that her pet's body stopped working. Parents are often confused about how to explain when a pet is "put to sleep". You could use this term with children, but remember to explain the difference between death and sleep and that their pet will not be coming back. It not necessary to try to make your child believe that death is final. Understand that acquiring this information is a natural developmental process that happens when your child is ready to accept it. You may even notice that it may seem like your child fully understands that death is final, only to be surprised a few weeks later to learn that they do not. This is perfectly normal. Believe in your child's ability to create a meaningful goodbye for their pet. Encourage them to make a special goodbye picture, write a letter to their pet or to have a special funeral or memorial service for their beloved pet. Ages 3-6. Suppose you have to tell your 4 year old that his pet has died. You may say,"Remember how Skippy didn't come home last night? I have some very sad news, Daddy found him this morning and he had been hit by a car. His body was so hurt from the accident that he died. Do you know what it means to die?" Don't be surprised if your child refuses to believe you, or insists that she saw her pet or heard him barking. Gently sympathize with you child, "That would be nice, but Skippy died, and we are all going to miss him very much." Ages 7-9 Keep in mind that the death of a beloved pet can invoke feelings that can be just as painful as the death of a person for children of all ages. Tell your child the truth about their pet, do not replace it and hope that they won't notice. It is helpful to their growth and development through childhood to learn how to process bad news and begin accepting that death is a natural part of life. Include children whenever possible when disposing of their pet's body and ask them about how they would like to say their final good-bye. Children have the natural ability to balance compassion and creativity to ensure that their pet has a meaningful burial or funeral. They may even wish to invite friends to honor the life of their pet. Ages 10-12 Children of this age group may want to help you make decisions about the disposal of their pet's body. However, know that they may also be quite squeamish. They may find significance and meaning in rituals that honor others, even their pet. A special pet frame or Pet Loss Tomauro Kit may be helpful to memorialize their beloved pet. Do not attempt to replace your pet with one that looks similar to lessen a child's grief. Talk to them about the feelings children and adults have after someone or something they love dies to help them process their own feelings. 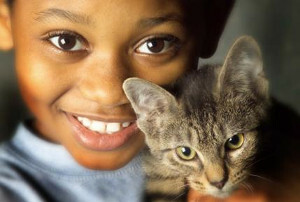 Teenagers The bond between a teen and their pet contains such unconditional qualities; therefore the death of a pet can be devastating to a teen. It is likely that teenagers experiencing this type of loss may have enjoyed several years with their pet throughout their childhood. It is important to validate and not minimize this type of loss for teenagers. They can benefit from hugs, offers to help them cope and little notes that show you care. Pet loss can induce many different feelings in teenagers and it is important that you allow them opportunities to process their loss in ways that they feel comfortable, as long as they are safe. 1.Draw a picture about your pet. Have your child tell you about his/her picture. 2. Document funny stories and special memories. 3. Gather together pictures for a scrapbook or journal. 4. Buy a headstone or decorate a rock to place at the burial site. 5. If your pet is cremated, involve your child in the decision about where to scatter or place the ashes. 6. Create a memory box. 9. Plant a tree or bush in memory of your pet, especially in an area outside that your pet enjoyed. 10. Donate money to an animal related charity in memory of your pet.